The tufted titmouse, Paus bicolor, is a small gray songbird with a gray head crest, a rust colored flank, a pale gray breast, and a small black area of feathers above its beak at the forehead. The male and female are alike in plumage and are generally told apart only by their call and behavior. The tufted titmouse is found in the Paridae, or titmice, family. 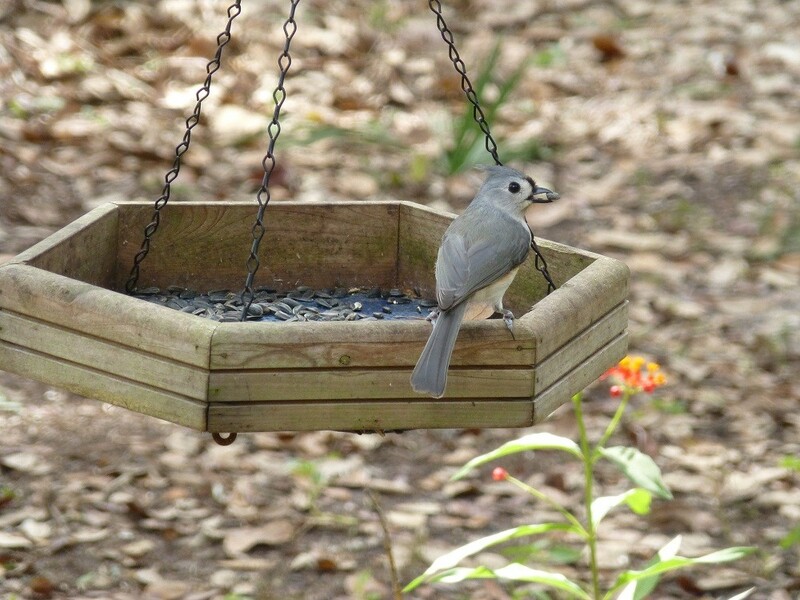 In central Florida titmice are year round residents and do not migrate. They are common at most bird feeders throughout the year. Their habitat includes woodlands, residential shade trees, and orange groves. Their range is from two to five acres during breeding season which is from March to June. They don’t have very elaborate courtship displays, but a lot of chasing going on by the male trying to keep other males out of his territory and chasing a female to join up with. Once a pair has joined they are rarely apart afterwards. During courtship the male may be seen bringing the female food with an occasional wing-quiver by the female, but that is about the extent of titmice courtship. 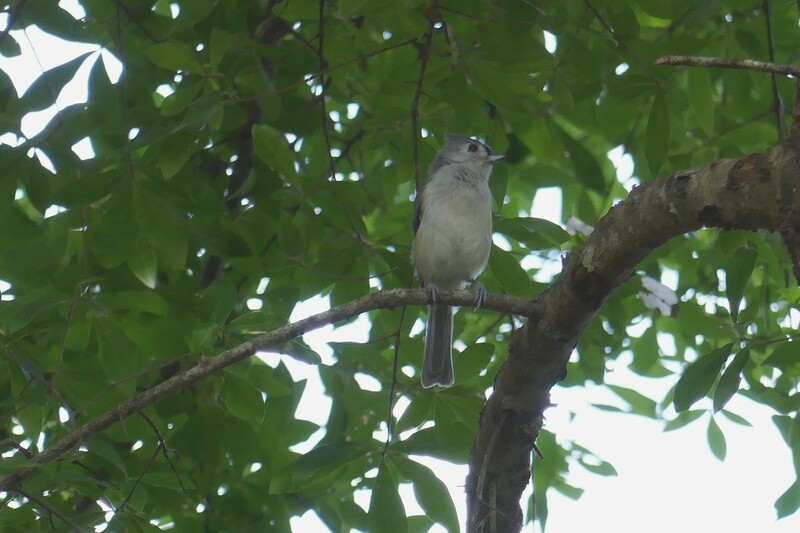 Tufted titmice are very vocal and a family group of five or six can make quite a ruckus especially when most of them are hungry babies begging for a meal. The group is usually fast and loud, darting around their territory, and is hard to miss.Their calls consist of sounds like peter, peter, peter, see-jwee, jway, high-see, here, here, here, and tseep calls. Their calls are very high pitched and very energetic. They are fast and noisy little songbirds. A titmouse’s diet consists of insects (such as ants, scale insects, cicadas, grasshoppers, and mealy bugs), spiders, seeds, mast, and berries. In Central Florida they feed on mulberries, elderberries, blackberries, grapes, wax myrtle berries, Virginia creeper berries, hackberries, blueberries and various tree seeds, such as beech and oak seeds. They will readily come to a bird, or suet, feeder and love sunflower seeds, peanuts and corn. However, they rarely stay perched on a feeder for more than a few seconds as they are very wary and cautious. In the winter time, when wasps aren’t active, they break into mud dauber, and paper wasp, nests to eat the larvae inside. The larvae supplement a winter diet that consists mainly of acorns. After they pair up in early spring the couple searches for a nesting cavity in a wooded area or residential shade tree. Nests are built in natural tree cavities, or old woodpecker nests, and can be found anywhere from three to ninety feet off the ground. Tufted titmice will nest in bird houses with a nest hole of at least one and half inches in diameter. The female is the one that builds the nest and the male brings her food during this time. She uses nesting materials that consist of leaves, moss, fine roots, strips of bark, pet hair, yarn, snake skins, and just about anything that she can find and carry, that is soft and pliable. During the springtime nest building season I can always find a female pulling dog hair out of the welcome mat. She will make repeated trips with large mouthfuls of dog hair and it is quite entertaining to watch. It generally takes her from six to eleven days to complete her nest. During the nest construction phase copulation occurs. Four to eight eggs are laid, but on the average only four. They are white speckled, or cream colored, with brown spots. The eggs are incubated by the female only and start to hatch over several days with the mother removing the shells from the nest during this time. The male always sleeps, and perches, very close to the nest during this phase. Titmice babies are altrical, which means that they that they are born without feathers and unable to feed themselves. The female is the one that keeps her brood warm and stays on the nest, but the male and female both bring food for the babies once they hatch. The babies leave the nest, or fledge, at fifteen to eighteen days. When they leave the nest they are not really adept at flying and are unable to get their own food so the parents feed them and teach them as they grow and learn songbird skills. 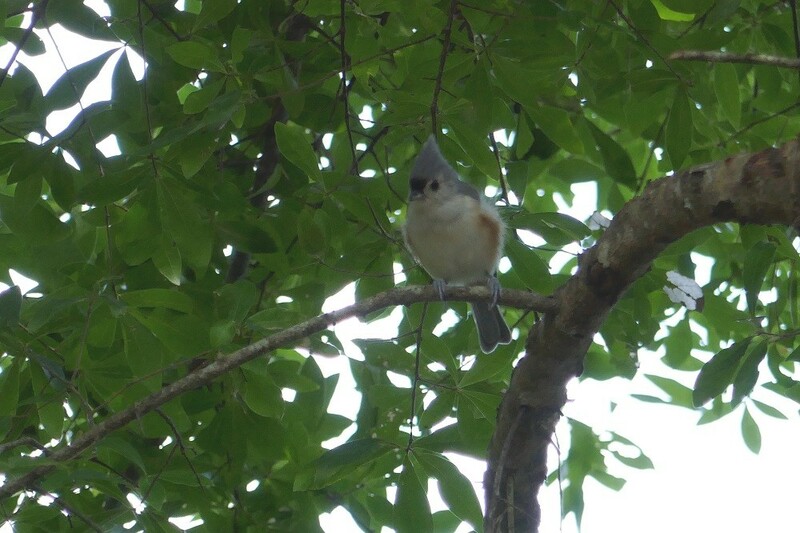 The tufted titmouse may have two broods per year in our area. When they are not actively breeding they can be found foraging in small flocks of mixed birds consisting of Carolina chickadees, nuthatches and small woodpeckers.